Magnesium – The Ultimate Heart Medicine offers a substantial breakthrough in cardiac medicine that could positively impact the lives of thousands if not millions of people and their families. Magnesium is the breakthrough. So is the approach that looks at and treats the alarming rise of mercury and the build up of calcium in heart tissues. Tie this in with the breakthroughs in emotional and spiritual medicine that have a direct bearing on heart tissues and the function of what is known as the heart or cardiac center (chakra) and we have a new comprehensive approach to heart health that should shake the world of cardiology. 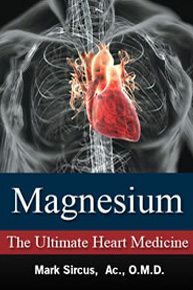 This book puts out a universal call to cardiologists and other healthcare practitioners interested in heart health to put magnesium as the lead item in their medical protocols. The evidence is overwhelming; magnesium chloride is the perfect heart drug but fortunately for us it is not a drug at all but a safe nutritional concentrate in its chloride form. Why don’t Cardiologists use Magnesium?